Mumbai, Dec 10: Mumbai City FC put an end to Chennaiyin FCs hat-trick of victories with a gritty 1-0 win in the fifth round of the Indian Super League (ISL) at the Mumbai Football Arena here on Sunday. Achille Emana kept his cool to convert a 60th-minute penalty for the only goal of the match as Mumbai City FC registered their second successive victory at home and got their campaign back on track after a disappointing start against debutants Bengaluru FC. The win took Mumbai's points tally to seven and put them in fifth position on the table. Chennaiyin FC, with their second loss in five matches, are placed third with nine points. Chennaiyin FC had arrived in Mumbai on the back of three successive victories and were attempting to equal their 2015 record when they had won five matches on the trot. They seemed to have got a good start in the opening 45 minutes when the visitors pressed hard with Mohammad Rafi coming close to securing the opening goal. The Chennaiyin forward, selected ahead of Jeje Lalpekhlua, had two good chances in the first half. The first came in the 29th minute when Jude Nworuh crossed from the left after a speedy run but Rafi, thrown off track by a defender, failed to get a touch inside the penalty box. Rafi could have struck again in the 45th minute but his header from close range went straight into the hands of goalkeeper Amrinder Singh. Chennaiyin FC have scored seven of their nine goals in the second half, so there was a sense of hope after the break. Rafi threatened again but it was Thoi Singh who missed the easiest of chances when he failed to tap the rebound with an open goal in front of him. Mumbai City were eventually rewarded for their persistence when Balwant Singh won a penalty. Emana played it through to Balwant on the left who tried to muscle his way inside the box, only for Mailson Alves to come up with a tackle. Despite protests from Chennaiyin FC, the referee had no hesitation in awarding a penalty which Emana had no problem converting. Mumbai should have sealed the match in the 75th minute when a long ball by Everton Santos saw young defender Anirudh Thapa fail to intercept. Rafa Jorda sensed an opportunity but his lob over goalkeeper Karanjit Singh sailed wide of the post. 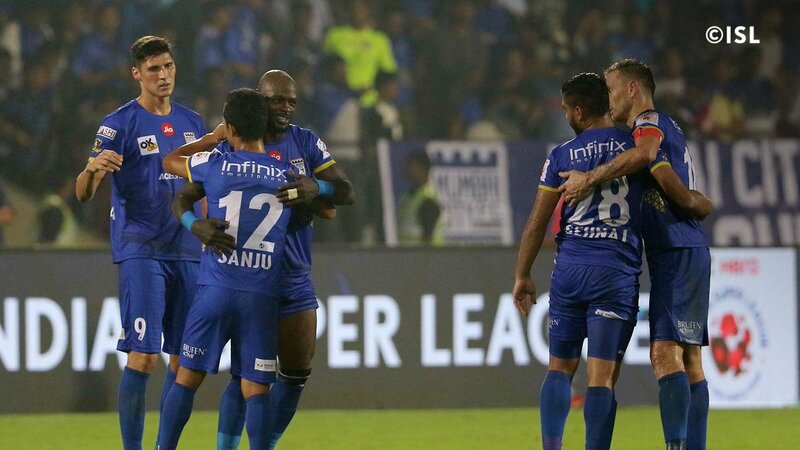 Fortunately for the hosts, Chennaiyin could not find the equaliser till the end as Mumbai celebrated an important victory at the final whistle.